the lamb stew is probably the more obvious entree choice, being katniss’ favorite and all. but this was a little more challenging… interesting… and not all my friends eat lamb. so i looked at several recipes, did my research on this dish, and decided that i would have to venture on my own and experiment on this one. i ended up taking inspiration from fictionalfood.net and butterybooks.com. i also looked at the recipe from the unofficial hunger games cookbook, but it wasn’t what i was looking for. as weird as the dish sounds, it was amazing. 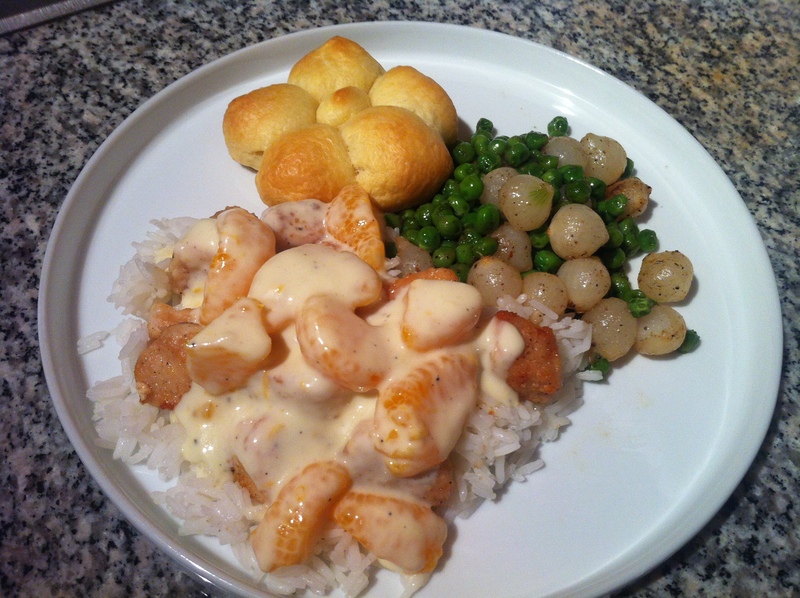 i made the sauce with only a hint of orange, so that when i added the mandarin oranges (i was NOT going to be bothered with segmenting an orange) it wouldn’t be overwhelming. apologies in advance… i don’t have very accurate measurements. 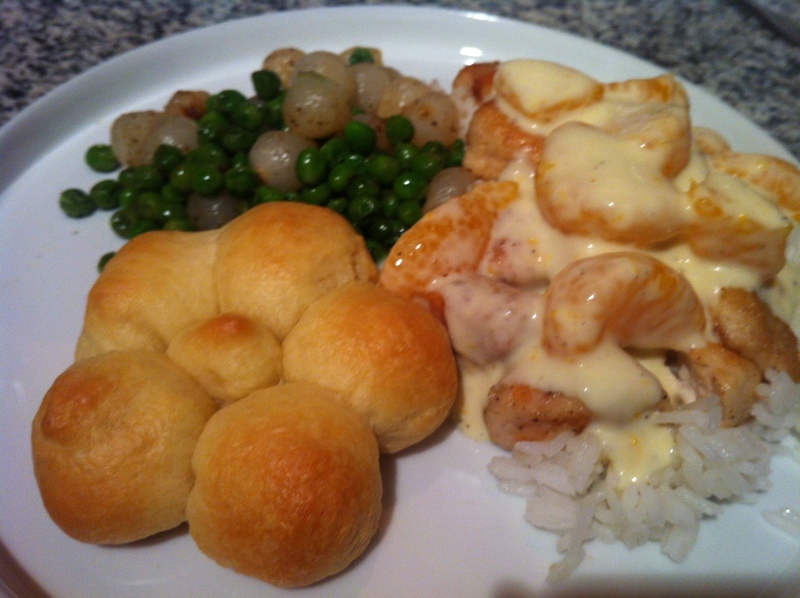 i was terrified of making the sauce too orangey, so i made the sauce extremely slowly and taste tested every minute. i think anyone else that tries this should do the same. i had jasmine on hand so i cooked it in some salted water. thought i would need to add butter but it was ok as it was. 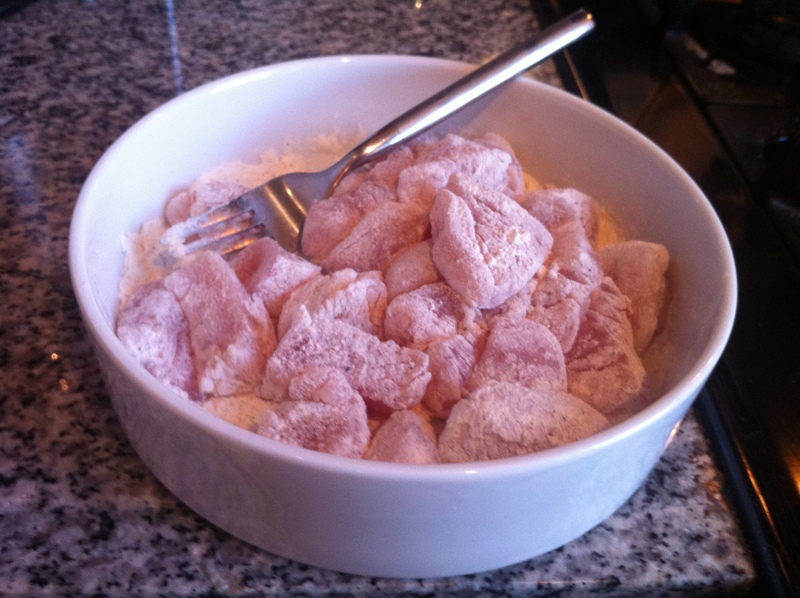 in a shallow bowl or plate, mix flour and some salt and pepper with a fork. set aside. 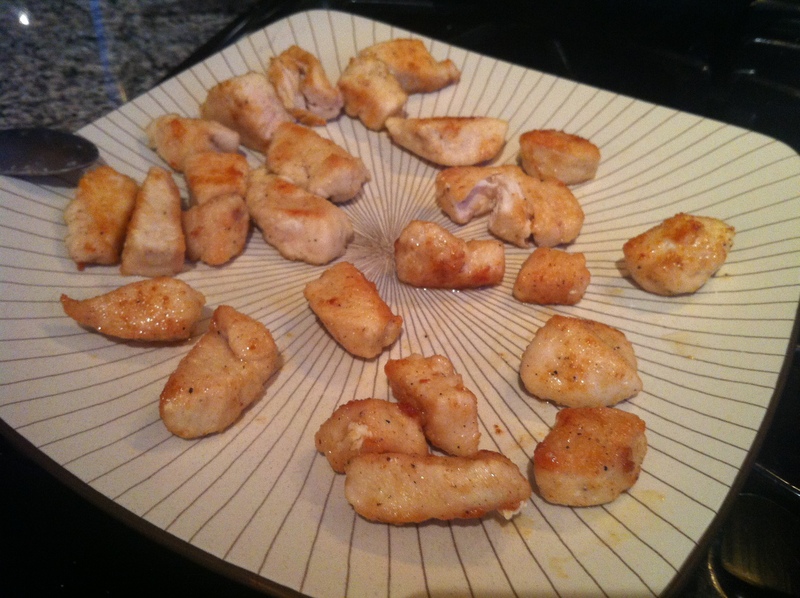 cut however many chicken breasts you are using into same-size chunks. toss with the flour to get a thin layer of flour on each piece. bring a heavy-bottomed pan to medium/medium-high heat and coat with vegetable or canola oil. shake off excess flour, and brown the chicken on all sides until thoroughly cooked. cook in batches so that the chicken does not touch each other. this will make sure to get a nice crust on the chicken. remove chicken to a plate, season with kosher salt as soon as it hits the plate, and set aside. try to avoid snacking… this will be tough since they taste like chicken nuggets. and do not wipe out that pan! unless it has a lot of badly burnt bits… then go ahead. over medium/medium-high heat, melt a couple tablespoons of butter. once the butter bubbles a little, whisk in enough flour to make a slightly loose paste. grate in a clove or 2 of garlic, and add a good tablespoon of orange zest. continue whisking while the roux cooks. do not let it go past a blonde roux. 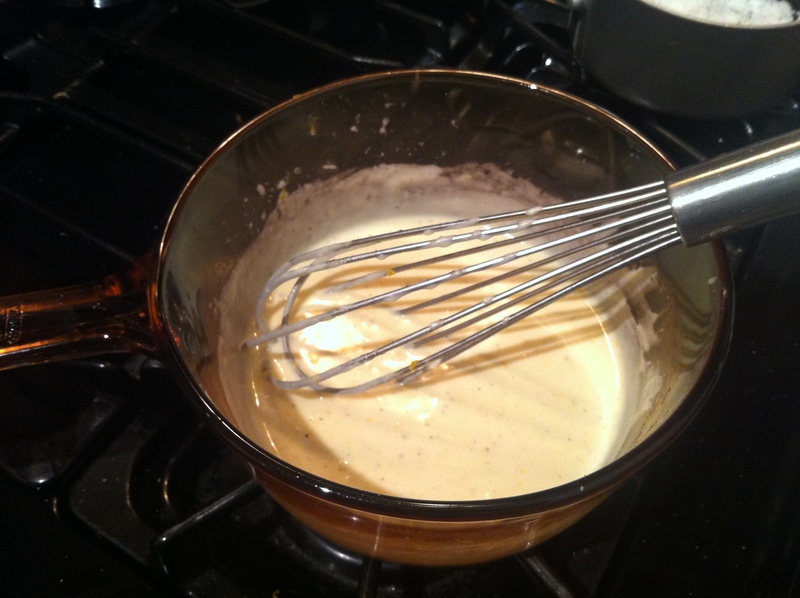 after the roux starts to bubble, pour in about a cup of heavy cream. continue whisking until the roux is incorporated into the cream. then pour in about an equal amount of milk, continue whisking. it will thicken. if it gets too thick, add more milk. season with salt and pepper and turn the heat to low. this is where you can let your imagination run wild. 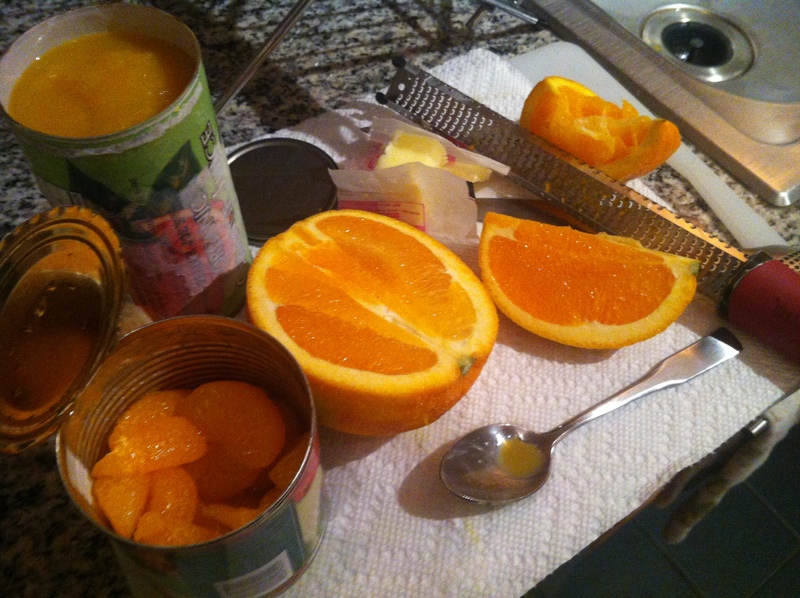 on hand, i had a can of mandarin oranges, a large navel orange, and frozen orange juice concentrate. i’m not sure if it was unsweetened or sweetened, but it was trader joe’s organic and it worked fine. you only need a little bit. i squeezed in some juice from the orange, and put in a small spoonful of the concentrate. SMALL. i feel like it can be very easy to go overboard here, so be careful and taste test after every addition. once you’ve achieved that creamy-with-a-hint-of-orange flavor, stop. i also added some extra black pepper for warmth. before serving, stir in some mandarin oranges (any excess syrup shaken off). add the oranges off the heat and once the sauce has cooled a little, otherwise the oranges will disintegrate into the sauce. we need those chunks of orange. 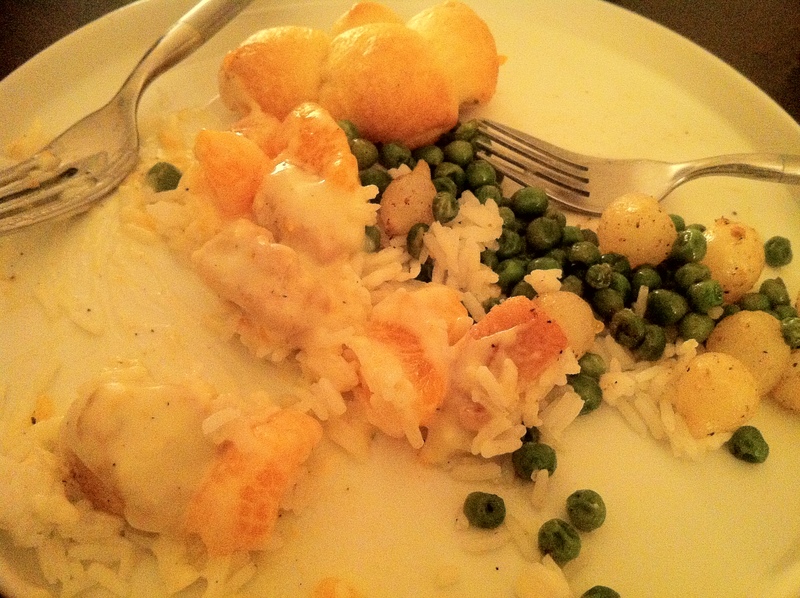 to serve: top the rice with the chicken, then pour on the cream sauce with oranges. melt a pat of butter in the chicken pan. 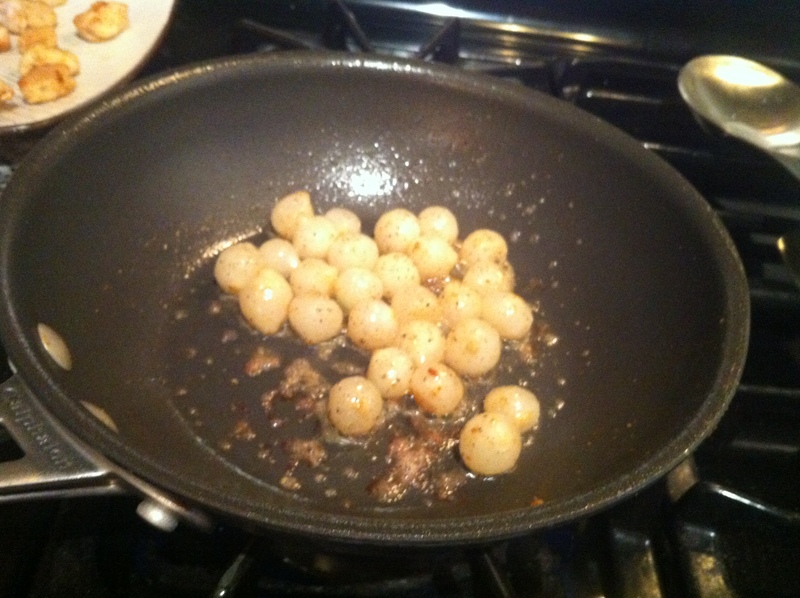 once hot, toss in some frozen pearl onions. they should still be frozen, not thawed. you can use fresh pearl onions here, but you may have to blanch and shock them to get them out of their skins. frozen worked fine for me. once they start to get some color on them, pour in some frozen peas. salt and pepper pretty liberally. 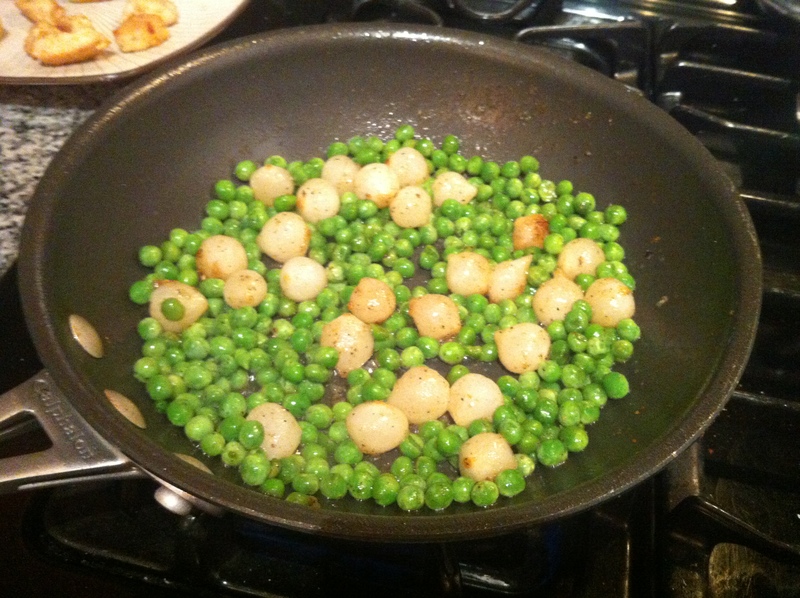 cook until the onions are a little charred and the peas are bright green. take off the heat to prevent overcooking. seems simple, but they should have some good flavor on them from the chicken drippings and butter. also, the bigger the pan the better, so the veggies don’t crowd and steam. i took the shortcut route, so it was easy. and fun! i used a tube of crescent rolls and tore pieces to make 5 large balls and one smaller one. put them together like a flower and baked according to directions until golden brown on top. the key here is to not squish the flower together, because while baking the pieces will expand and it might not be as flowerlike if it’s too tight. 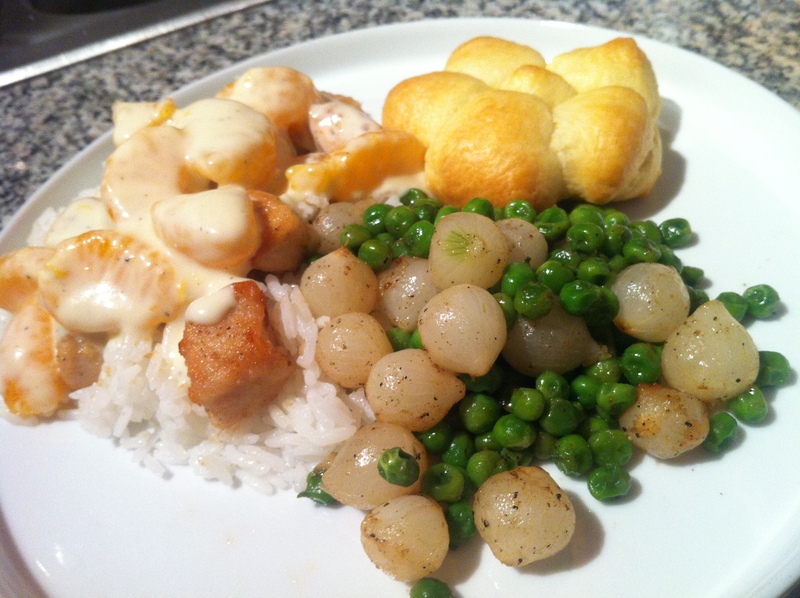 i had all the pieces just touching, and when they were done it was like pull-apart bread. in the end, you have a delicious, capitol-approved meal. i don’t think effie trinket would have approved of my roommate and i sharing a plate.